Did you know that people have brain sorters that keep their brains from getting cluttered with unnecessary thoughts? Sometimes these brain sorters get mixed up, though, holding onto thoughts that frighten kids. If this has happened to you, if it’s hard for you to feel safe or sure of yourself because scary thoughts have gotten stuck, this book is for you. What To Do When Your Brain Gets Stuck guides children and their parents through the cognitive-behavioral techniques used to treat Obsessive Compulsive Disorder. This interactive self-help book turns kids into super-sleuths, able to recognize and more appropriately respond to OCD’s tricks. Engaging examples, activities, and step-by-step instructions help children master the skills needed to break free from the sticky thoughts and urges of OCD, and live happier lives. This book is the complete resource for educating, motivating, and empowering children to work toward change. 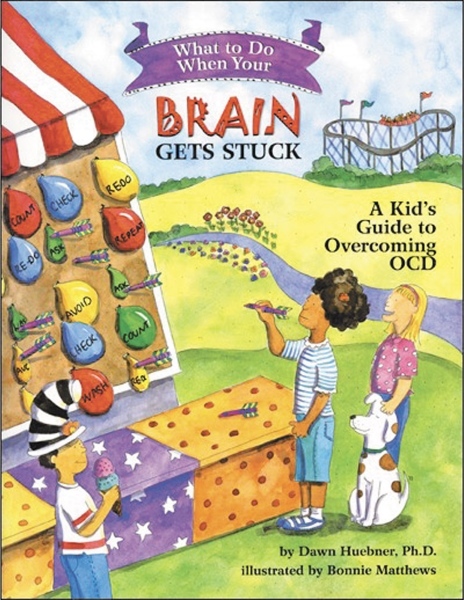 Dr. Huebner tackles OCD in a way that is comprehensive, developmentally appropriate, and fun. This guide is an invaluable tool to demystify OCD and help children heal. 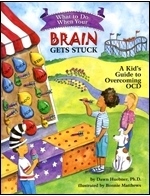 This book provides practical exercises and strategies for kids coping with obsessive-compulsive disorder. Another excellent self-help guide by Dr. Huebner, consistent with the evidence based literature on OCD. My patients find these books to be delightful and, most importantly, very helpful.